This shows just how high sprites can go. The photo shows their red forms reaching all the way from the thunderstorm below to a layer of green airglow some 100 km above Earth's surface. 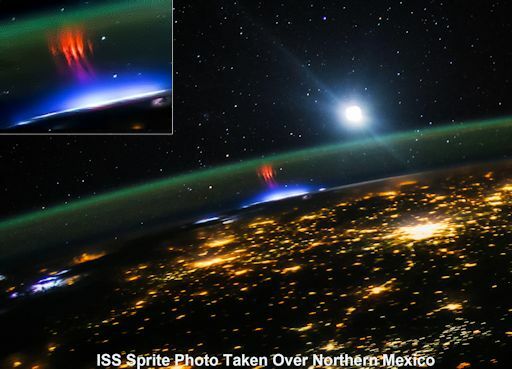 This means sprites touch the edge of space, alongside auroras, meteors and noctilucent clouds. They are a true space weather phenomenon. "Trolls are also known as 'secondary transient luminous events," explains Oscar van der Velde, a member of the Lightning Research Group at the Universitat Politècnica de Catalunya. "They are occasionally observed alongside big clusters of sprites, and they can reach 40-60 km high." 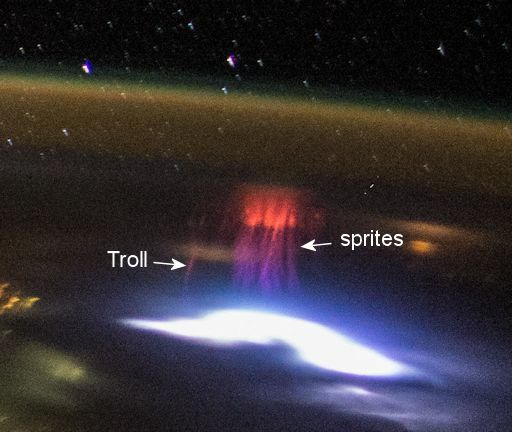 Van der Velde says that sprites can actually pull Earth's ionosphere down toward the thunderstorm. When the gap shrinks, and the local electric field intensifies, Trolls appear. You don't have to be onboard a spaceship to see these exotic forms of lightning. "Sprite chasers" regularly photograph the upward bolts from their own homes. Van der Velde has photographed Trolls from ground-level, too. "I recorded these trollslast October over a storm over the Mediterranean Sea west of Sardinia and Corsica," he says. Browse the sprite gallery for more examples. Er zijn nu 471 mensen aan het browsen op het forum. 2 Daarvan zijn ingelogd. Van die 471, lezen 3 mensen het topic "Winter discussie 2014-2015 Deel 3".